Hubby's birthday was in early March. Birthdays are pretty low key around here. For me, I'm looking for a mouthwatering dinner with my Hubs. And of course, cake. Plus extra cake for breakfast the next day. We usually go out to dinner for my birthday. For my Hubby it's even lower key. He just wants a good homemade meal. That's it. No cake. No pie. No cookies. Kinda a birthday party pooper if you ask me. So I asked my better half what he wanted for his birthday dinner this year. He said, homemade turkey meatballs with scampi type sauce, roasted sweet potatoes and roasted parmesan zucchini. The two sides would be no problem. But, scampi meatballs, huh? Weird. Thankfully it wasn't hard to talk him into traditional shrimp scampi since he loves shrimp. We eat shrimp at least once a week, sometimes twice. My favorite way to prepare it is marinated in Italian salad dressing and then grilled (though I don't seem to have that preparation on the blog for some reason). We eat shrimp straight up with veggies on the side, as a protein in salads and over pasta. For all the shrimp we eat, I'm a little surprised I have never made shrimp scampi. 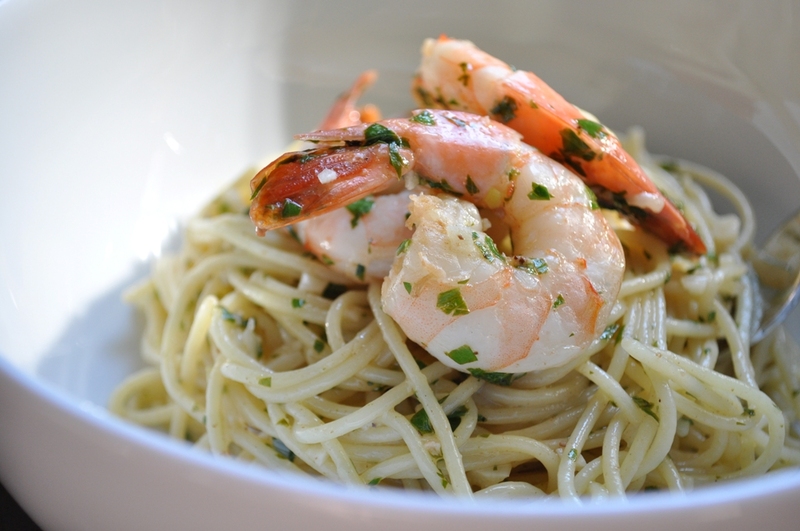 Scampi is a luscious and pungent white wine sauce perfumed with aromatic garlic and herbs (we love garlic by the way). The reason I've shied away from making scampi is because I assumed that it was loaded with a stick or two of butter. It only took a quick look at my Cook's Illustrated Cookbook to find the right recipe. And to my surprise, it was relatively light on the butter with just 3 tablespoons divided amongst 4 servings. Plus the recipe had "simple" in the title. Simple is good. And in this case, simple is also delicious. The dish comes together quickly. Definitely in the realm of a 30 minute meal. If you buy shrimp already peeled and deveined it's even quicker. I like to buy frozen uncooked peeled and deveined shrimp to keep on hand at all times. You never know when you need to make shrimp! For Hub's birthday dinner I served the shrimp scampi over a toasted flat bread brushed with olive oil (bake in a 350 oven for 8 to 10 minutes until lightly toasted). You could also use a crusty loaf of french bread, split down the middle. The lemony, garlic wine sauce soaks into the bread. It's like garlic bread and shrimp scampi all in one. Delicious! Unfortunately I didn't get to photo the bread version. I made the scampi again a couple of weeks later and served it over pasta. I felt the sauce was much more subdued in the pasta as compared to the bread version. Though good with the pasta, I thought the bread with scampi sauce was a "Wowza!" dish. I'll take seconds please! Heat 1 tablespoon of the olive oil in a 12 inch skillet over high heat, until just smoking. Add half of the shrimp and cook about 1 minute, stirring occasionally until opaque. Transfer to a bowl and repeat with remaining oil and shrimp, transferring the cooked shrimp to the bowl. Turn heat to medium low and add 1 tablespoon of butter to the skillet. Add garlic and cook until fragrant while stirring continuously, about 1 minute. Remove the pan from the heat and add the lemon juice and vermouth or white wine. Return the skillet to the heat and whisk in the remaining 2 tablespoons of butter. Add parsley and pinch of cayenne and season with salt and pepper to taste. Add the cooked shrimp and it's juices back to the pan and stir to combine. Serve immediately. Oh my goodness! YUM!! Thanks for sharing at oopsey daisy! Your hubs is so cool, requesting something so unique. Mine is predictable-steak, steak, pasta, or steak. And he doesn't like shrimp! This is hard b/c I loooove it. I might have to make this for myself on a day when I'm home alone. mmm It looks really yummy and I wouldn't have thought to put it on bread-thanks for the tip! I like a low key birthday too. If my husband was a better cook I would absolutely ask him to make me a nice meal at home. 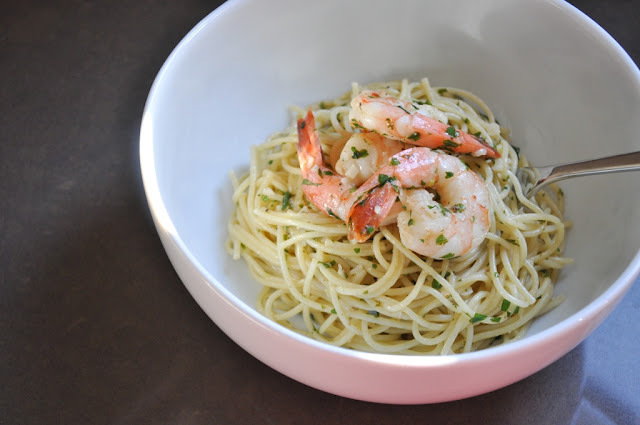 Not to say he's not willing, but it's usually just easier for us to go out :) This shrimp scampi looks fantastic, I am definitely adding it to my to-do list. Sounds perfect for a weeknight! The scampi has been added to our weeknight dinner rotation. So simple and flavorful! This looks like a yummy birthday meal. But I do need cake, or pie or cheesecake or cookies. I'm really not hard to please. I'm with you! A birthday isn't a birthday without something sweet. This dish has turned into a weekly regular our house. You can't go wrong with easy AND delicious!